Apart from history, culture and heritage, Split is without doubt a city that looks out to the sea. That's why yacht charter Split will allow you to experience in a city with a sea flavor. 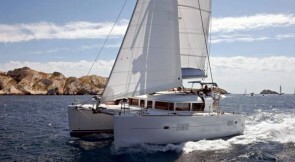 Enjoy a yacht charter in Split with Top Sailing Charter - a nautical trip made just for you! Split is a city located in Croatia, the seaport of the Dalmatian coast, on the Adriatic Sea. Split is also one of the main cities of Dalmatia and it is located 380 km away from the capital, Zagreb. Also, it is an important fishing port and an industrial area that manufactures ships (the shipping industry has always been very important), cement, plastics, wood, wine and processed foods. Split is considered a World Heritage City by Unesco, a melting pot of cultures dating back to the Roman times. Boat rental Split will enable you to appreciate all the beauty of this region from the deck of your boat. You also will be able to contemplate the hill of Marjan and the old town, which is an architectural jewel located on a hill of 1330 m high. You can also visit many of its natural parks such as Sustipan, Strossmayer or Katalinić hill. Split yacht charter will allow you to visit beaches such as Bacvice, Kastelet, Kasajuni or the beautiful beach Bene all by yourself. Do not miss Diocletian's Palace in the center of the city, built in limestone and marble and surrounded by walls and towers, whose south facade overlooks the sea. You can also stroll through the old town to reach the promenade and the Varos neighborhood, the most traditional in the city. Also, you can enjoy its museums and markets, such as the fish or the green market. If apart from walking you want to relax, try the roman baths of Split spa, you will not be disappointed! With yacht charter Split you can do all this and much more always enjoying the sea and wonderful views that will accompany you throughout the whole trip. Go sailing on the Dalmatian coast!